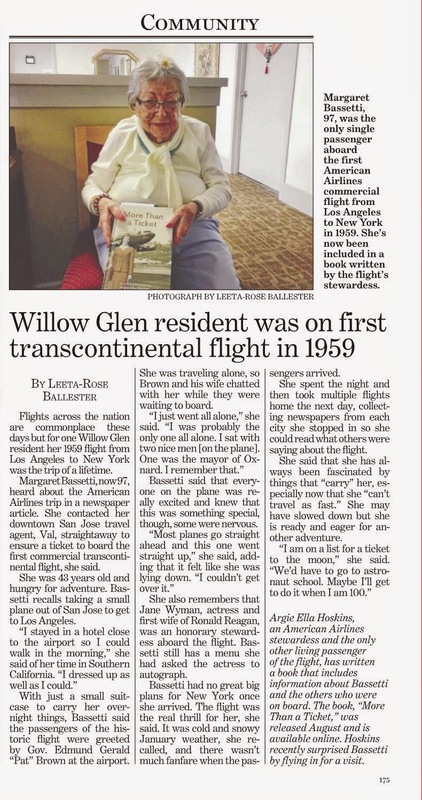 I had the wonderful opportunity to launch my book: More Than a Ticket Memoirs Flying with American Airlines from Prop to Jet with a former passenger from the historical flight of the Boeing 707 Inaugural Flight from Los Angeles to New York on the 25th of January 1959. This is an article from the San Jose Mercury News which appeared several days after the exciting day with Margaret Bassetti. The signing of my book was an event that was both an honor for me and a humbling experience. The book has opened the doors to new relationships with those individuals viewed now as friends. Two other former American Airlines stewardess with whom I flew at the same time out of LAX or Los Angeles attended the special day. Joan my friend from Hawaii and California surprised the day with her arranging a very busy schedule to attend the celebration for Margaret and the signing. Lona, oh, Lona, speaking about turning the memories back. We had flown together out of LAX. She honored the day, also. I couldn't believe that this cake was baked for the occasion! Former American Airlines Stewardesses doting over former passenger; we care! Former Passenger Margaret and Former American Airlines Stewardess Argie, "once a stewardess always a stewardess." Part two: "On Wings of Time," features short stories from AA stewardesses, pilots, flight engineers, and passengers. The young and old, casual readers and aviation enthusiasts will be delighted with memoirs. I have dedicated these words with love and respect to my flying friends, an expression of appreciation for the community of American Airlines.